Recently I had an outage where we thought we had lost the vCenter database. I joined the hosts to another vCenter, while we worked around the original problem, and I was soon reminded that my hosts were using distributed switching and I had probably lost that distributed switch information. I would probably need to rebuild that vCenter and move them back. Someone will say, what about your dvswitch backups? Well, sadly this was running 5.0. From this KB I don't have an option to backup dvswitch configs unless I'm running 5.1 or later. Yet another reason to upgrade, right? In the end, the DB access was recovered, and I had my old vCenter. We didn't even have to restore, simply the access was there again, but this applies also with a restore. However, since I had moved my hosts to another vCenter, when I joined them back they did not immediately fall back in place. The hosts knew they were no longer connected to the old vCenter, so they did not reconnect when it was again available. I had to add them manually. However, the vcenter had them grayed out so I had to first remove the hosts, and then add them. Once I added them, I checked the network settings and the physical interfaces were not were they were supposed to be. I went to the networking tab and confirmed the distributed switches reported no hosts as members. Adding the hosts was not difficult for my data networks - the wizard asked if I had to migrate any vmkernels and did a good job of pointing out which had to be migrated. This one did not appear when doing the Data switching. 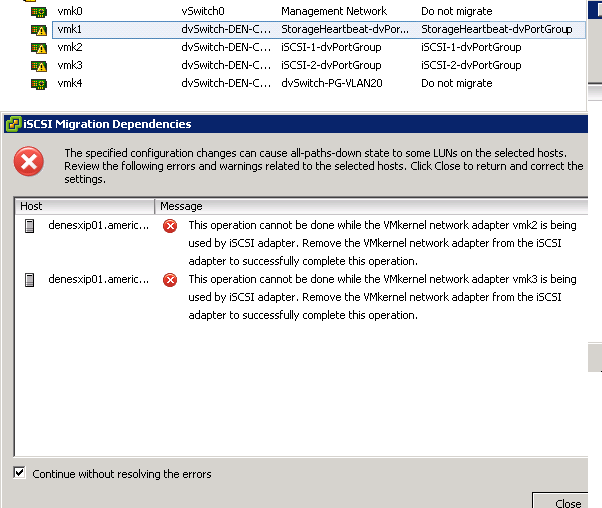 The alert is valid - you are moving a vmkernel with active iscsi traffic, which is possibly catastrophic. My first thought was "wow - so i'll need to get some downtime on the VMs, and possibly create another host, and migrate VMs over, before I can put this back the way it was". After meddling around and thinking, I convinced myself there should be a way of doing this without downtime, since the host by itself has active iscsi switching and I had no downtime. 4) and I picked a host with a few non critical VMs as a testbed. The test was successful, and I was able to re-incorporate my hosts into the distributed switch with no downtime. Looking back, should I have moved the hosts to another vCenter until I made sure the DB was tuly unrecoverable? Maybe not. But I sure like knowing what's the worst that can happen now. In my particular case, where I don't have many hosts, I have opted to remain with normal vSwitches, for my new environments. This is because of a particular reason: we are trying to consolidate many vcenters into few, and this will help the host portability, and the movement of VMs from one vcenter to another without downtime. This is oversimplified but I just wanted to post this as it's my explanation to my DBAs. As I keep learning the technology I will update this post. I do have “write acceleration through cache” capabilities, but they have to be disabled when whole VM backups run, because they snapshot the data on the array. This is because when you use a cache for write, some data can be on the cache and not on the array (yet) – this will lead to inconsistent backups, which is a big problem. The good news is that it’s not a problem for backup applications that operate at the VM level. "VADP policy automates flush for proxy VMs. For physical use PS automation" PS being power shell. @arielsanchezmor @vmpete @jtlutgen You can do it right in the UI: Advanced->VADP, then add the backup VM. Set backups to hot-add. That's it! Nvidia, multi-monitor VM and Office can cause "VMware Workstation unrecoverable error (vmui) Exception 0xc0000005 (access violation) has occurred"
There is a whole KB explaining the possible causes. ...and wait a bit. Workstation abnormally ends with the error in the title (in my case it's Workstation 10 on Windows, I will confirm if this happens in Fedora). However, the summary solution is to disable 3d acceleration on the VM. I turned it off to do this first: then Edit Settings, Display, a little check that says "Accelerate 3D graphics", make sure it's emptied, and turn the machine back on. If you are using Office 2013, you could also disable office hardware acceleration. If I find where to do that in 2010 i'll update the post.